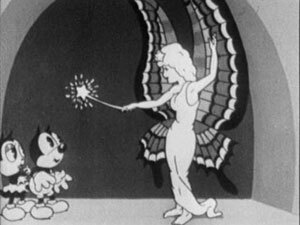 Mice frolic, cats dance, and a menagerie of happy animals provide loony performances in these merry symphonies from the golden age of animation. Nevertheless, Terry left the studio to eventually go on to greater things (more or less), and Van Beuren re-named the studio after himself. 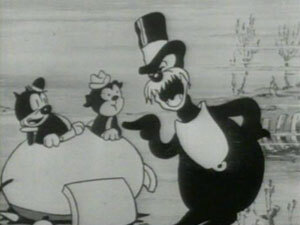 He hired a new crew led by John Foster to take over production of the films, and sound did indeed become standard, but the animation and stories weren’t much slicker. 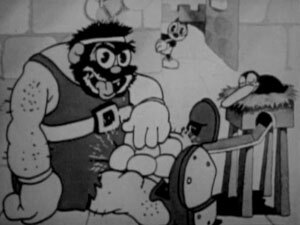 The Van Beuren studio would keep pumping out the same type of mediocre cartoons until moving on to their color Rainbow Parades series in 1934, which was the year following the release of the final Aesop’s Fables cartoon. 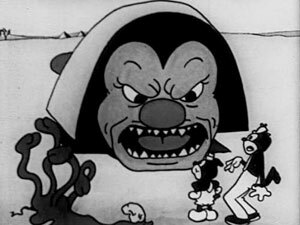 However, one should keep in mind that “mediocre” does not mean “bad.” Though the Aesop’s Fables series did not do anything to advance the form, the cartoons in the series did nevertheless include some creative animation and surrealism that on occasion rivalled what the Fleischers were doing. 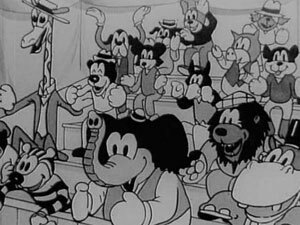 Sure, the series has more than its share of boring barnyard theatrics, but then so did the early Disney shorts. At their best, the Van Beuren cartoons could be just about as entertaining as anything their contemporaries put out. Keep in mind we’re talking about a time that predated Bugs Bunny; and Popeye was yet to become an animated cartoon star. 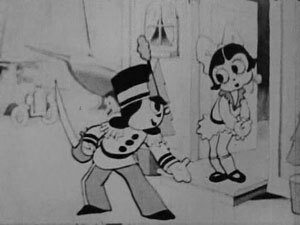 Really, only Disney had successfully come up with a popular sound-era character by the time that 1930 hit (though Betty Boop would come out later that year). 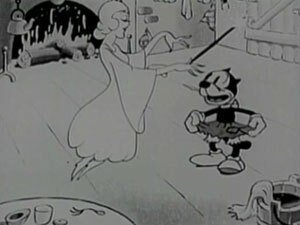 Judged by the strength of what was coming out at the time, the Van Beuren cartoons actually look pretty decent. The fact that they never evolved much farther was their true downfall. 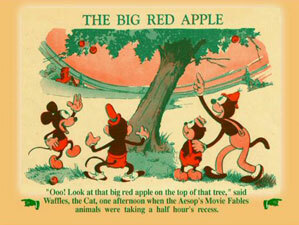 Though named for the famous fables of old, the cartoons did not attempt to tell those ancient stories. They did offer morals, but rarely did those morals actuallt reflect what was in the cartoon. In fact, they didn’t even make sense half the time. Some are clever, but others are baffling. Examples include, “An oyster is a fish dressed up like a nut,” and, “Many a man who is a boon to his mother is only a baboon to the rest of us.” Huh? 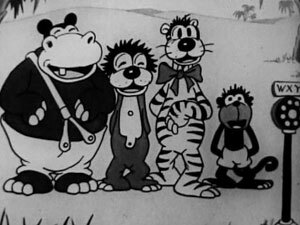 The cartoons were mainly one-off efforts, though there was frequent use of Terry’s farmer Al Falfa character, and new characters were also introduced. 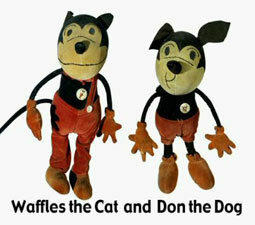 Waffles and Don got a few try-outs, to be followed by the Van Beuren Tom and Jerry. Most of the shorts exist only to serve up fun animation, rarely telling much of a story, even if some sort of narrative does often emerge— often involving a chase or a simple love story. These are not cartoons of great depth, but they do offer some simple pleasures. 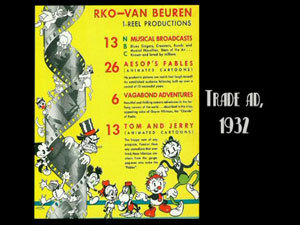 They are also vital to an appreciation of the 1930s animation scene. Thunderbean, the company that has endeared themselves to vintage cartoon collectors now for several years, has put out two volumes of Aesop’s Fables on DVD. 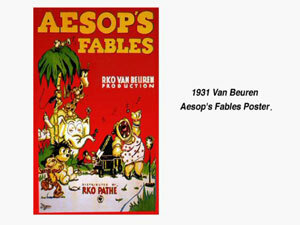 For the purposes of these collections, producer Steve Stanchfield has focused on the sound era, when the series was known as Aesop’s Sound Fables. Steve claims to have watched every single one of the Fables (very impressive! ), and has chosen some of his favorites for these collections. 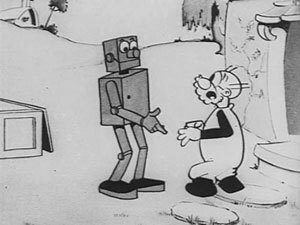 The Iron Man (1930) – Farmer Al Falfa chases away a minstrel cat and receives a robot delivery; who knew there was ever a robot in a Farmer Al Falfa cartoon? 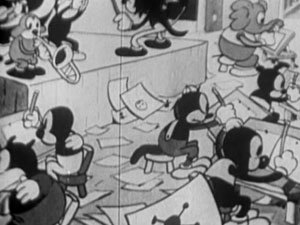 Makin’ ‘em Move (1931) – classic short showing the inner workings of an animation studio; a must-see! The first disc has a surprisingly wonderful selection of bonus features, even if there are no audio commentaries. 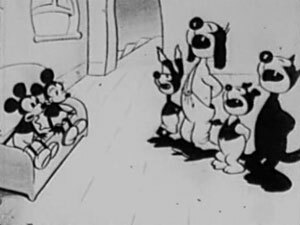 In the text feature An Aesop’s Fables Primer, Chris Buchman provides a short essay that gives context to the shorts, acknowledging their weaknesses but also pointing out that many other cartoons of the era were of a similar calibre. On-screen liner notes for individual cartoons also provide useful commentary here. The Still Galleries provide a wealth of images of original posters, home movie boxes, titles cards (theatrical and home movie versions), vintage dolls, and even a 1931 Fables book, purportedly done by the studio’s artists. With Meet The Aesop’s Maestros, Buchman returns to give us information regarding music directors Josiah Zuro, Carl Edouarde, and Gene Rodemich. Concise but interesting biographies are followed by photos of Rodemich’s sheet music, and 3 posters from live action films he scored (including a Chaplin short, and Bring ‘em Back Alive). Sing Along is a cute poem accompanied by images from the films and some music box-type music. On another release, this would seem totally superfluous and silly, but here it seems more like a loving tribute. Edison 1902 Disk Of Siamese Patrol is the original audio recording of a song featured in two Fables— Toy Time and Silvery Moon— performed by the Edison Military Band. It’s obscure, and so it’s fascinating that Thunderbean included this. The audio is scratchy, but this just shows how much attention Thunderbean gives their DVDs. Just wow. 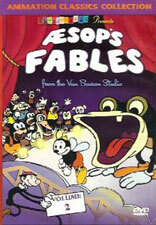 Similarly, Original Recordings of Fables Songs offers those for The King’s Horse and The Woman In The Show. 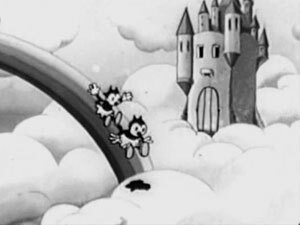 Scene Comparison compares how Siamese Patrol was used in each of the Van Beuren cartoons it appeared in. 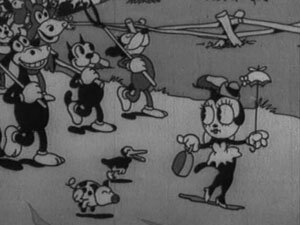 It turns out that the animation was largely repurposed from the 1931 short for the 1933 one, substituting cats for the original mice. 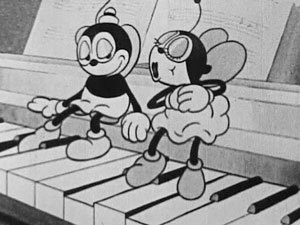 Aesop’s Fables Music is more text from Buchman, where he makes the point that the shorts’ music was derived from popular, classic, and novelty music of the day. Henry Schmidt adds further notes on the music found in the cartoons seen on the DVD, summarizing from what pieces the scores were derived. 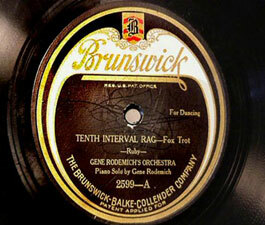 Rodemich On 78s is a sampling of Rodemich recordings from 1924, complete with shots of the records! Having covered so much ground in the first volume, there was less to include for the second. However, the on-screen Liner Notes by Steve Stanchfield are a lovely insight into just why these cartoons can be enjoyed for what they are. Stanchfield mentions that they are “honest” in their efforts to entertain, without any loftier goals of advancing the form or developing new technologies. He doesn’t get into the specific cartoons, as there isn’t much truly noteworthy about any of them, but he makes a good point in that they do serve a simple purpose and do so with energy and charm. 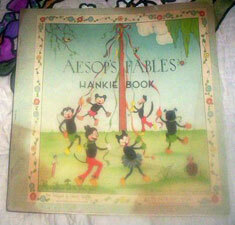 Aesop’s Hankie Book is, yes, a vintage hanky-sized cloth book based on the series. Nifty cool. Trade Ads can also be found, along with a photo of a set of collector buttons. Both volumes come in standard keepcases. Neither has an insert, which would have been nice. These aren’t the strongest covers that Thunderbean has used, but don’t be put off. 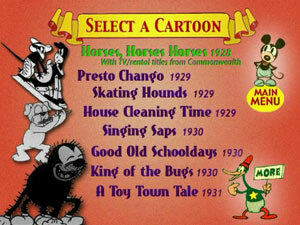 There are a whole variety of surprises within the varied cartoons on the discs. Using original 35mm and 16mm prints, Thunderbean has done their very utmost to provide the best viewing experience possible. While full restoration would have been far too expensive, the prints were cleaned up as best they could be, and the result is much appreciated by this fan. There’s no getting away from the expected scratches and defects, but the prints are generally in pretty decent shape, with strong transfers. There is no DVNR, and no significant artifacting. Some cartoons look better than others, naturally, yet you can rest assured that the differences are simply due to the materials themselves, and you won’t see them looking better anywhere else. At worst, some shorts lack detail or look muddy, and there is certainly variance in brightness; but many of them look quite good. The cartoons, really, simply look like a product of their time, acting their age while still making for acceptable viewing. 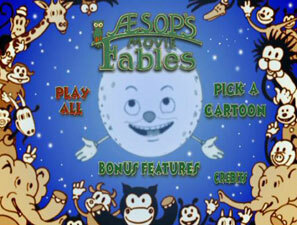 The cartoons are mildly window-boxed to ensure that the whole image appears on your TV screen. Again, only so much can be done with materials this old while on a budget. Fidelity varies, but distortion is kept to a minimum and nothing about the sound is disagreeable. While listening, pay careful attention to the soundtracks, as these shorts have some of the most underrated cartoon music of the era. We tip our hat once again to Thunderbean, for not only providing vintage cartoon fans with a lovely selection of rare cartoons, but also presenting them in the best light possible in terms of technical specifications, as well as compiling bonus features of impressive depth. If you want to sample first, go for the first volume, which has stronger cartoons and more bonus material; but chances are your interest in these shorts will carry over to a purchase of the second volume as well. On these discs you will discover the magic of animation in a pure form— not as technically sophisticated as works from other studios, but still earnest in the attempt to entertain.